Jafar's loyal parrot, typically one to mouth off, spends much of his time sitting rather silently on his master's shoulder. When not accompanying Jafar, he flies about the city, spying on his master's enemies. When Sora, Donald, Goofy and Aladdin return to the palace to rescue princess Jasmine, it is Iago who steals the lamp for Jafar. When Jafar has transformed into a genie, Iago carries around his black lamp during the confrontation, and upon his master's defeat, is sucked intot he lamp with him. 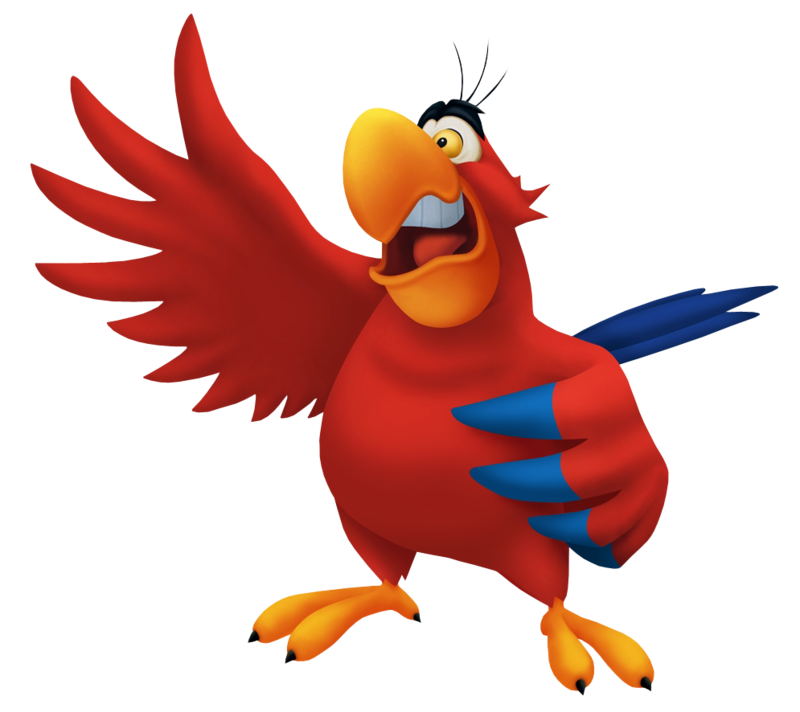 A loud-mouthed parrot typically in a bad mood, Iago was Jafar's servant in Kingdom Hearts, usually appearing at his shoulder, though he did play more significant roles as he stole Genie's lamp, and carried around Jafar's own during his genie-form battle. In the end, Jafar is defeated, and both wind up sucked into and trapped within the lamp. Preceding the events of Kingdom Hearts II, however, he manages to escape from the lamp. Iago discovers Sora, Donald and Goofy as they arrive in Agrabah, and while he is initially not trusted, he is owed by the three when he accidentally knocks out a group of Heartless pursuing them. He follows the three in the hopes that he will be able to prove himself and apologise to Aladdin and Jasmine for his actions in the year past. He helps lead the three into the Cave of Wonders, and at the conclusion of the first visit, his apology is accepted by Aladdin and Jasmine. Iago's supposed change of heart seems short-lived, however, because during the second visit he acts to distract Sora while Jafar lays waste to Agrabah. During this and after, however, he swears to the others that he was forced to betray them, and though they are understandably cautious this time around, they are willing to give Iago yet another chance.